1. to assemble (troops, a ship’s crew, etc. ), as for battle, display, inspection, orders, or discharge. 2. to gather, summon, rouse (often followed by up ): He mustered all his courage. 3. to assemble for inspection, service, etc., as troops or forces. At the last #slpchat, an OT asked how to make a hashtag that a community might use similarly to the #SLPeeps tag – which has united an entire profession on Twitter. 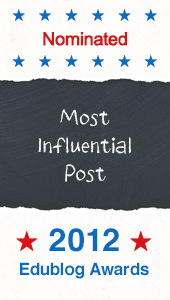 At the same time, @pediastaff has been doing a ton of work to create The PediaStaff Social Media Learning Center Featuring #SLPeeps (#1823 in the Career Fair section of the exhibit hall – more on this below) for the upcoming ASHA 2012 conference. A physical booth dedicated to online PLNs for SLPs and Audiologists with a hashtag in its’ title? You bet that’s a hashtag that has ‘stuck’. So, here’s how our community created the hashtag and made it stick so well. Disclaimer: This may or may not work as well for you if you decide to create a hashtag, but the following elements seem to contribute to general popularity of use. To understand how #SLPeeps was born, you need a bit of history. If history is boring to you, skip the next two paragraphs. I joined Twitter in March of 2010 at my husband’s insistence that it could be used as a learning tool (contrary Twitter’s claim that I joined in November of 2009 – I was most certainly still in the ‘scoff’ stage‘ of Twitter acceptance at that time). I found around 15 SLPs to follow and was exceptionally lucky to have jumped in just as a tight-knit group of professionals was finding each other and beginning to share knowledge, ideas, learning, etc. After a short time, we began to realize how much professional growth (and bonding) was happening in each of us as a result of these long and intense conversations that were occurring almost daily. A problem arose, however: what if you were actually busy in real life during these great conversations and sharing sessions? You missed out on a great learning opportunity and possibly an opportunity to swap resources. We agreed that we needed a way to track our group’s conversations more easily so no one would miss anything really great just because they were busy at that moment. This is when I learned how hashtags were being used on Twitter and decided we needed one of these to help track our conversations and make sure we didn’t miss out. But we had to find a term that wouldn’t be confused or used by others. #slp was often a common tag people were using but if you searched it, you also found tweets using it to mean ‘sleep’; not helpful to have 50 other tweets in the middle of the conversation we were trying to track. At this same time, @speechbob put out a general #FF to all of his SLP ‘friends’ on twitter. In order to save space, he created a great witticism, saying “to all my SLPeeps”. Everyone loved the term and thought it was brilliant and I realized that no one on Twitter could possibly use the word “SLPeeps” in any other context imaginable. I took a poll, everyone liked it, and voila – a hashtag was born. 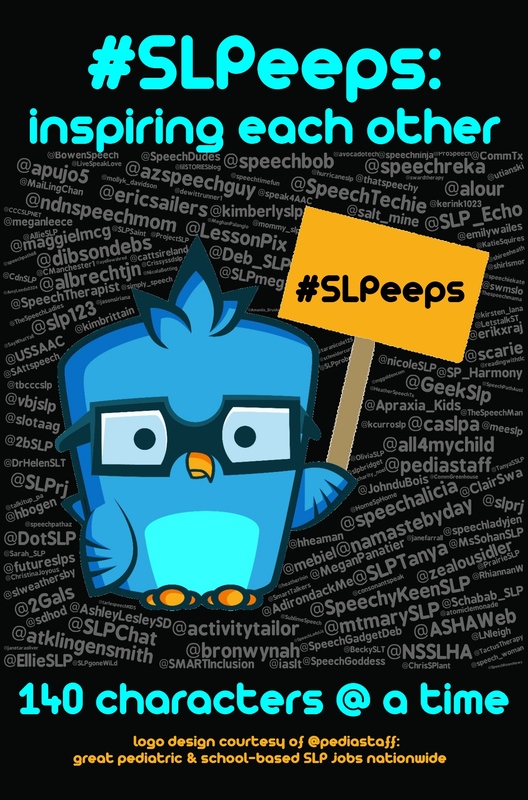 Note: While Bob originally was mashing ‘slp’ and ‘peeps’ together, the tag has come to represent all speech and language professionals, whether your title is SLP, SLT, SLPA, or otherwise. Many tend to think of it as “Speech and Language Peeps”. Now we had all agreed on a very unique hashtag and we had planned to start marking all our tweets with it whenever a really great conversation began to emerge. Except, this is difficult to do in a naturally evolving twitter conversation. Suffice it to say that we would forget to do it, especially when we were caught up in a really good discussion. After a short time, however, we realized it was better to use the #SLPeeps tag to flag especially pertinent tweets for everyone to notice. This is what the tag is used for today, and to great success. The success is because our small group or original #SLPeeps began using the tag consistently to mark tweets that would be interesting to the rest of our group. This consistency is key. If we were only using it occasionally, I don’t think it would have bound the group as well as it did or taken off to such popularity. I still remember around early summer of 2010 when our small group began to notice ‘strangers’ (new twitter SLPs we didn’t know) using the tag to mark tweets of interest to other SLPs. This both surprised and excited us. We had never considered that others would begin to use it, but since we were modeling its use so much, of course other SLPs joining Twitter began to use the hashtag. With those three things, you can usually get a hashtag off the ground. I’ve launched quite a few, including #SLPeeps, and as long as I am or someone else is using them regularly, so do others. The #SLPeeps tag has become an identity for our community – we proudly refer to ourselves as “the SLPeeps” and now we have mascots/logos and you can even buy #SLPeeps merchandise online! More on that below. This ‘branding’ isn’t necessary for a hashtag to become commonly used, but it certainly helps. This is especially true if you are trying to unify an entire community of people online. Frankly, it requires a bit of luck (we certainly stumbled into it with the #SLPeeps tag) and/or a certain type of community. I’m not sure that #AUDPeeps has taken off as well, partially because the online community of audiologists generally has a different ethos from the SLPs online. Plus let’s face it, SLPs are a loquacious bunch, which also contributed greatly to the success of our hashtag unifying us as a global community. It also helps to have something catchy/witty that people like to say, like SLPeeps (thanks, again, Bob!). Nothing says branding like a booth devoted to an online community! Thanks to Pediastaff.com (particularly Heidi) and several core #SLPeeps volunteers that pediastaff has amassed (they need more, by the way, if you’re interested) there will be a physical social media learning center (booth #1823) at the exhibitors hall at ASHA 2012 in November. 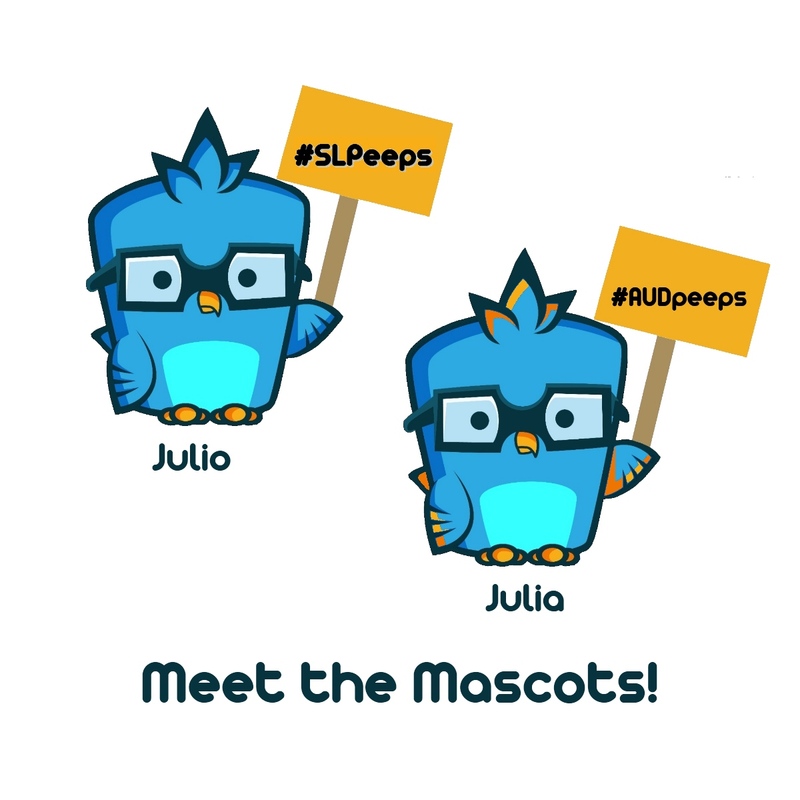 With community input and a lot of hard work on Heidi’s part, we also have very cute mascots: Julio for the SLPeeps (pronounce wholio) and Julia for the AUDPeeps (pronounced wholia). The booth (#1823 – find it here before you go) will be a place for #SLPeeps and #AUDPeeps to find each other and connect in real life, but it will also be a place of learning for those interested in online PLNs. There will be rotating lessons there on using Twitter, Pinterest, Blogs and more. There will be information and sessions targeting beginners as well as the tech savvy. There’s even curriculum available and a learning lab on the Friday for people to come learn about social media and SLPs/AUDs. The booth will be staffed by PediaStaff and #SLPeeps/#AUDPeeps volunteers (have I mentioned they need more volunteers to help? 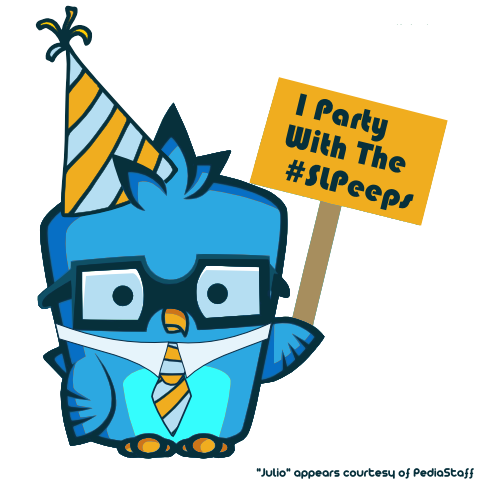 Contact Heidi @pediastaff if you’re interested – c’mon, you know you want to ‘party with the #slpeeps!’ – which reminds me to thank Bill @Lessonpix for adding to @pediastaff’s Julio and creating the ‘I party with the #SLPeeps’ image – located in my sidebar. Read here how Bill is trying to have exhibitors join forces around the #SLPeeps). If you’re going to ASHA this year, consider volunteering at the SocMed Learning Centre booth for an hour. I’m so disappointed that I couldn’t participate in all of this, but very glad to be at home with my baby. I’ll actually be volunteering from home via Skype, hopefully, so you don’t have to go to help out! Also, don’t miss the three “tweet and greet” opportunities to record a video message to the #SLPeeps/#AUDPeeps who couldn’t come! They’ll be posted to youtube later. Whether you’re going to ASHA or not, there will be several contests running for everyone to participate in so stay tuned for more on that! Spreadshirt SLPeeps Store is the best (and cheapest) place to buy the shirts/hoodies. If you get ladies sizes, order up, they fit small. You can also get very nice mugs and an iphone case there. I’m still waiting for my shirt and mug to get to Canada so if you’re international, order right now to hopefully get them before ASHA. Zazzle SLPeeps Store is the other store with keychains, tote bags, different mugs, water bottles, magnets, ornaments and shrits. The shirts cost a lot more here, though. The benefit to the zazzle store is that everything they have can be personalized! I got a keychain with my twitter handle on the back. For a lot more $ if you’re interested in personalizing your shirt, zazzle is the place to get it. It’s an exorbitant amount in shipping outside of the US though. Thank goodness I live on a border town! Please leave a comment and tell me how you came to be in the #slpeeps/#audpeeps community!